Click on the link below to go to Publish America to purchase a print copy, or for a download version click on the Whiskey Creek Press link. If you'd rather have an autographed book, see details on the "Autographed Books" link. As the Punjohpur sails down the River Mersey and Liverpool disappears from view, twenty-two year old Priscilla Thornton’s noble ideas of serving her country by accompanying 241 evacuee children from Britain to safety in Canada are beginning to wane – and well they might. The year is 1940 and Britain is at war. When fate assigns Cilla’s childhood sweetheart Ted Evans, a signaler in the Royal Navy, to the Punjohpur, he is furious to find Cilla has ignored his advice and is aboard. Four nights later, at the height of an Atlantic storm, the Punjohpur is torpedoed. In the chaos Ted and Cilla are separated. Over the course of the next three months, Cilla faces raw terror, cold, hunger and captivity. Far from being a tale of failure and despair, this is the story of a young woman’s emotional growth through her own courage and determination to survive and to be reunited with Ted. 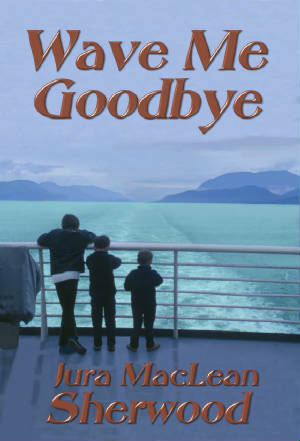 “Wave Me Goodbye has a great sense of history. Skillfully woven into all the drama is a compelling love story and the spirit of courage, and you have a book that is hard to put down.” - Bernice Curler, author of Visionaries and Glory Road. Click here for an electronic download.